DJI just revealed a new, delightfully tiny drone called the Mavic Air. It’s a lot like the DJI Spark, announced last year, but its rotor arms fold in making the little bitty aircraft even more little bitty. If you set the Mavic Air on the table next to your smartphone, you’d find they have about the same size footprint. The drone is a lot fatter, though. As the name implies, the Mavic Air is a smaller, sleeker version of the Mavic Pro. The company’s presenter on stage during the announcement event, Michael Perry, made a big show of how you can stuff multitudes of drones and remote controllers into the pockets of a pretty skimpy jacket. The entire thing is half the size of its sibling. Still, it maintains some impressive specs, including a three-axis stabilized 4K camera with a seven-camera vision system. This enables the Mavic Air to see in three directions, a perk that other tiny drones don’t enjoy. Meanwhile, being almost half the weight of the Mavic Pro, the new Mavic Air enjoys a 21-minute flight time. And thanks to antennas in the landing gear, the drone has a 2.5-mile range. What’s especially impressive about the Mavic Air is a host of new software that makes the drone easier to fly and makes complicated shots easier to capture. 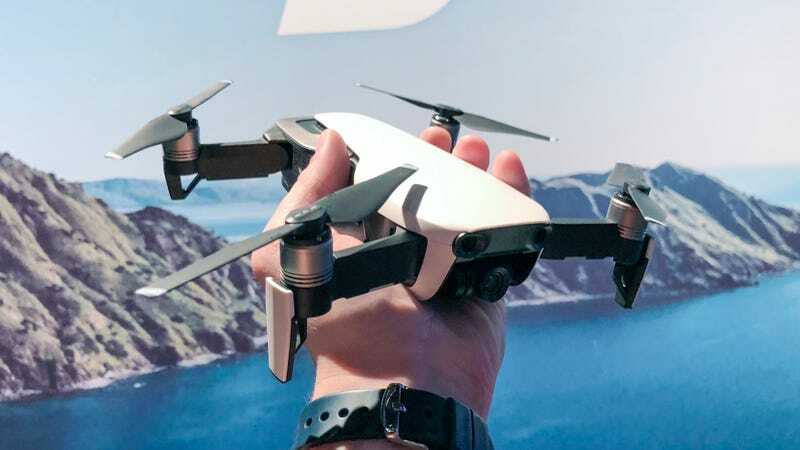 Like the Spark before it, the Mavic Air features gesture control—DJI calls it “Smart Capture.” This lets you control the drone by pointing your palm at the aircraft and moving it around. While we found that gesture control didn’t work great on the Spark, DJI promises that it’s upgraded and more responsive on the Mavic Air. There’s also some new gestures like the ability to use two palms to make the drone move further from or closer to you. The gesture sort of resembles pinching the screen to zoom on a smartphone. Then there’s the upgraded obstacle avoidance system, dubbed APAS (Advanced Pilot Assistance Systems) by DJI. Unlike the Phantom 4 and the Mavic Pro before it, the Mavic Air’s new system doesn’t just stop when it senses an obstacle in front of it. The drone uses a 3D-mapping system to fly around or above obstacles. That should mean that you could send this thing into a forest, and it would fly around trees without the pilot needing to steer. At least, that’s what DJI promises. No DJI update would be complete without some wacky new flight modes, though. There’s a new feature called Asteroid that makes the Mavic Air fly all around you and then creates a spherical image of your surroundings that, well, it looks like an asteroid. There’s also a new Boomerang flight mode that is also exactly what it sounds like. When activated, this mode makes the drone fly like a boomerang around you, which is great if you’re looking to do a big reveal. Of course, the drone won’t be cheap: it’s $800, including a battery, charger, a redesigned remote control, and a whole host of accessories, including propellor and gimbal guards. You can spend another $200 for the Fly More Combo, which includes two more batteries and a battery charging hub. Those price points put the Mavic Air at a little less than half the price of a Phantom 4 Pro which starts at $1,500. The Mavic Air is also slightly cheaper than the Mavic Pro which costs a clean $1,000 and more expensive than the tiny Spark which costs $500. If DJI’s promises pull through, however, the Mavic Air can do some things that none of these other drones can do. Which is exciting for such a little thing.